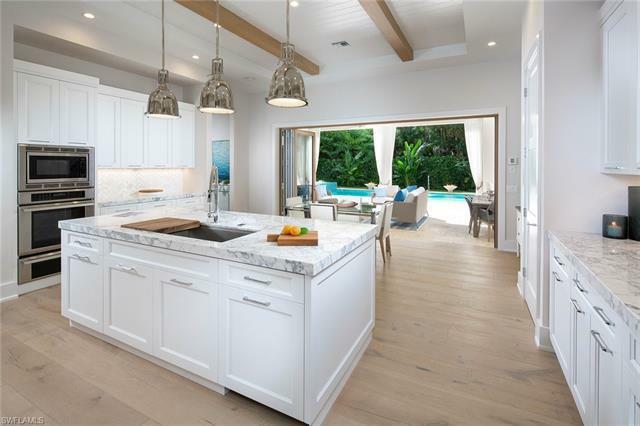 Perfectly situated on an oversized lot with ample space to relax and enjoy the outdoors, this new construction Olde Naples home is a dream. Coveted southwestern exposure fills the home with natural light while the newly refreshed design by Montana and associates offers a coastal chic flair. The two-story great room plan with 4 bedrooms plus den lends itself to any lifestyle. Crafted with meticulous attention to detail, residents will appreciate the custom wood bi-folding doors, Ali Kriste cabinetry, Calcutta gold stone countertops, Sub-Zero and Thermador appliances and a 300-bottle wine cooler found in the butlerâs pantry. An expansive outdoor living area features a kitchen, two fire features and a sparkling pool and spa. Centrally located close both the white sandy beaches and hustle and bustle of downtown make this the ideal Naples oasis. Check out the video on Vimeo or in the Virtual Tour link.